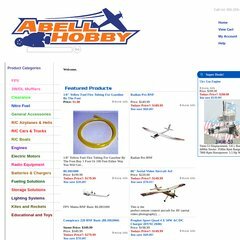 www.Abellhobby.com - Abell Hobby - Remote Control Specialists! The estimated 35 daily visitors, each view 3.00 pages on average. It is hosted by American Registry For Internet Numbers (Virginia, Chantilly,) using Microsoft-IIS/6 web server. Its 3 nameservers are ns4.volusion.com, 54136-web1.sat.intensive.int, and ns3.volusion.com. ASP.NET is its coding language environment.